There are two things that are becoming more important these days. Recycling and protecting your personal data. Both these things have prompted many new innovations in recent years, but some products have seen new increases in sales as a result. When it comes to personal information, there is nothing better than a shredder to destroy any evidence of address and other details. There are many types on the market that have different specifications, but they all do the same basic things. To help with your garden and recycling, you can purchase a garden shredder. They can turn your branches, leaves and other wood into chippings that you can put on your garden. This buyer’s guide will list some of the features you can expect from shredders of any type, home, business or garden. It will detail the advantages and disadvantages of each one and give you an idea of which will be best for you. Paper shredders are quickly becoming a normal part of the household, with more people concerned about protecting their data. 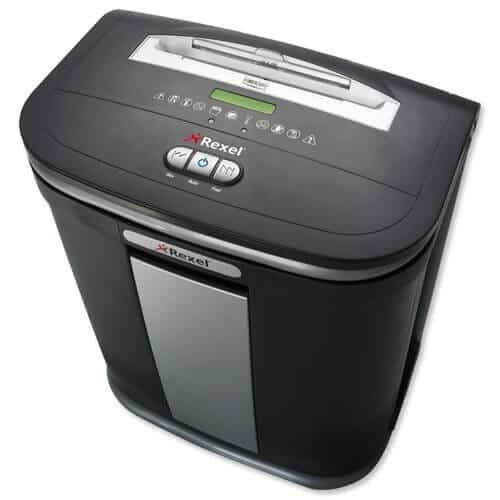 Shredders are getting more features to help shred all the documents and discs that you have data recorded on. They can also help you destroy credit cards as well for peace of mind. There are various sizes of shredder depending on what you need. You can get small portable versions for the home, or larger industrial ones for large companies. The big differences are the amount of paper they can cope with at one time and the capacity they can hold. The capacity the shredder can cope with in one pass depends on the power of the motor and the strength of the cutters. This can vary the capacity from 8-10 sheets up to 20 or more. Most household shredders are approximately 10-12 sheet capacity and this is more than adequate for day to day use. The vast majority of paper shredders are powered by electricity. This is because many units are used in the house and office. There are some very small personal shredders that are done by hand using a handle, but these are often difficult to use. There are also some battery powered versions, but the power needed to operate the motor can drain the batteries quickly. Early shredders were only able to cope with paper, they even struggled with paper clips and staples. Modern shredders however, are able to do far more. Not only can they now handle more sheets of paper at each pass, they can also cope with staples and paper clips. Some also have the ability to shred CD’s, DVD’s and credit cards. This has become increasingly important because more data is stored on digital media as opposed to paper. Even smaller shredders designed for the home, now have slots for plastics. The size of the bin and how easy it is to empty, varies depending on the model. The best products usually have 15 – 20 Litre capacity. This usually equates to 100 – 150 sheets of shredded paper. These are the typical sizes for a household shredder, industrial versions will hold far more than this. Those with a slide out bin are far easier to empty and less messy than the others. Early shredders worked by cutting the paper into thin strips. This however, was not the most secure way as sometimes the strips could be stuck back together. The new shredders use a cross-cut blade that cuts the paper into small pieces. This is far more effective and is used by many organisations. There can be a big price difference depending on the power and size of the shredder. Obviously, the industrial versions are more expensive than the household versions. Overall, because of the choice and variation of the types you can buy, there should be a shredder on the market that can do exactly what you need. There can even be a big variation in price depending on the make you buy, but the cheaper versions can sometimes be less well-built and have less power. If you have a lot of trees and bushes in your garden, then you will spend time pruning and cutting them back in the winter. Many people now decide that they want to reuse the wood that they get from their garden. Some use it for outdoor wood burners, and some use it to put on the garden as chippings. For this reason, garden shredders are becoming more popular. They chip and mulch leaves and branches so that they can be used in other ways. There are many types that you can get depending on your needs and space. Garden shredders come in petrol and electric versions. Each has its own good and bad points. Electric versions are ideal for the small to medium garden as you don’t have to move the shredder very far. It also gives you a constant source of power without having to stop. Petrol shredders are good for big gardens, or for businesses that need to transport the shredder to different locations. The only downside is that you need a supply of petrol with you in order to continue working. The capacity that the garden shredders can deal with depends on the size and power of the shredder. The petrol types tend to be bigger and more powerful, but are less easy to manoeuvre. Although there are many powerful electric shredders, they can only deal with branches up to 50mm in diameter. Hoppers and chutes are usually typical across many brands, although there are a couple that have used clever ways to store them. One type made by Bosch, allows the hopper to be kept in the collection bin when not in use. This makes the unit much smaller and easier to store away. Some types have a separate chute for larger branches and use the hopper for smaller ones and leaves. Garden shredders are made from either tough plastic or mental. Some have a combination of both, but this is usually just for covers or panels. Both materials are hard wearing and tough, although the plastics can crack over time and the metal types are prone to rust. The motors used are usually very strong and durable. The petrol varieties are typically 2-Stroke versions which are reliable and easy to maintain. Both types usually have safety features built-in that prevent the motor from being overloaded. There are also safety switches to stop the motor in the event covers or other panels are not secure. The price of garden shredders vastly depend on the power and size of the product. Some of the smaller garden types are affordable although have limited capacity. High-End types are usually used by businesses and large homes. As is usual with products of this type, the price reflects the quality of the product. Garden shredders are becoming more popular and they are now seen as a great way to recycle in your own garden. They can range from the powerful, heavy duty versions, down to the simple small types. Either way, it is best to assess what you will need the shredder for, before you decide on the best type.